Venice attraction-guides.com - Venice, Italy attractions guide Venice Palazzo Ducale (Doge's Palace) information about attractions, historic paintings by Tintoretto, Tiziano and Veronese, Gothic architecture, open hours, admission charges, fortress, ceremonial staircase, location and address, tel / telephone number, general tourist information about Palazzo Ducale (Doge's Palace) in Venice (Venezia) area, Italy (Italia) IT - Last updated 30/10/2012. The view of Venice's Palazzo Ducale (Doge's Palace) from the waterfront is quite breathtaking. Doge's Palace was originally built as a fortress in the 9th century and has been renovated and enlarged over the years, from the 12th century onwards. 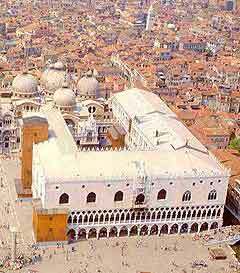 By 1438 the structure of Venice's Palazzo Ducale (Doge's Palace) was complete, although further minor adjustments to the palace have been made since. Attractions at Venice's Palazzo Ducale include grand rooms with painted ceilings, guided tours of the palace, richly decorated chambers, the Scala d'Oro - a lavish ceremonial staircase designed in 1555, and the Sala del Maggior Consiglio - the Grand Council Chamber. Other attraction at Doge's palace in Venice include numerous historic paintings on display by artists such as Tintoretto, Tiziano and Veronese, and a tour of the ancient prisons, where the world-famous Cassanova was once held.